Serving on a board should be a rich, satisfying experience, but many times it is not. As we talk with leaders of churches and Christian agencies, we hear a lot of frustration about the effectiveness of boards. People want to know how to be good directors and what their essential responsibilities are. They want to know how to participate well-how to have vigorous discussion and debate and still keep board relationships healthy. Directors want to understand the danger spots as well as best practices. Serving as a Board Member will help directors shorten the learning curve and improve their governance skills. It is a great board orientation tool for new board members and an excellent refresher for directors with more experience. 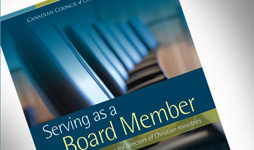 Want to buy a Serving as a Board Member book? 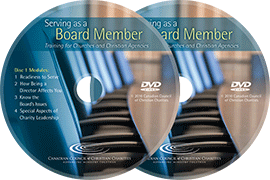 Full participation in Canadian Council of Christian Charities (CCCC): Regional Seminars - Serving as a Board Member DVD is applicable for 3.0 points in Category 1.B – Education of the CFRE International application for initial certification and/or recertification. Includes a link to download presentation handouts and board resources! "A few weeks ago I was given a copy of your book, Serving as a Board Member – Practical Guidance for Directors Of Christian Ministries​.​​ Reading ​this book has reinforced what the Holy Spirit has​ ​placed in my heart about governance. It is a gift and an act of faith​ ​(Romans 12:8). ​This book has encourage​d​ me to pray for that standard in my life​ ​and in service to my own congregation. "